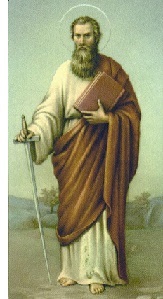 The Apostle Paul (ca. 5-67 A.D.) - Next to Christ, the most important figure in Christianity. Originally a Jewish Pharisee who persecuted Christians, the book of Acts describes his miraculous conversion. His name was Saul, and while he was traveling to Damascus to imprison followers of "the Way" (as Christians were originally called), he was blinded by a bright light and confronted by the risen Christ. At that point, he became a Christian and began to preach that Jesus was the Christ. He traveled the Roman Empire spreading the gospel, planting churches and he wrote about two-thirds of the New Testament (by length). Near the end of his life, he was imprisoned in Rome and reportedly beheaded by the Emperor Nero.